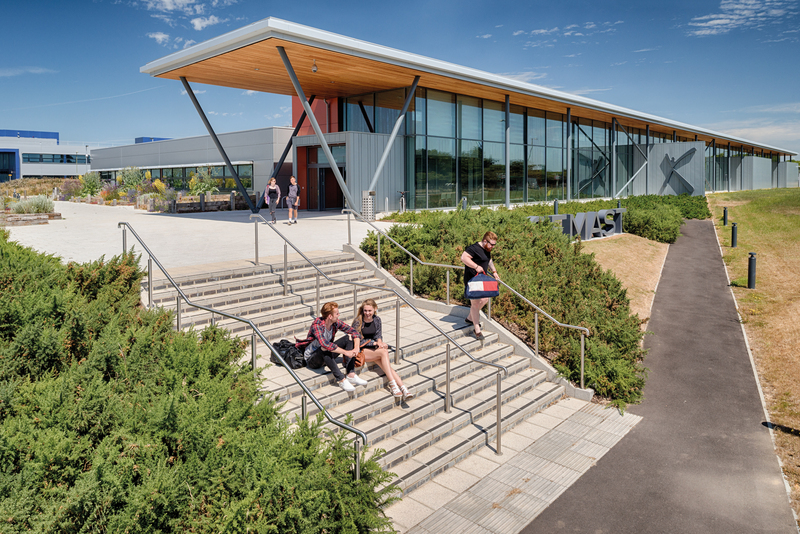 Opened in September 2014, Solent Enterprise Zone is home to Fareham College’s Centre of Excellence for Engineering, Manufacturing and Advanced Skills Technology (CEMAST) providing training opportunities for 900 students. It also includes the new Fareham innovation centre providing small workshops and office space for start-up and micro businesses on easy-in, easy-out terms. Around this innovative new build, creative use of hard landscaping was required to enhance the site, to develop and identify areas within the perimeter for pedestrian use, to contribute to safety underfoot on flights of steps and around the bicycle shelter areas as well as providing sustainable urban drainage solutions (SuDS) for the approach to the site and within the car park. In the showpiece location at the approach to the college and inside the grounds around the planted beds and seating areas, Pallas and La Linia block paving have been installed. These elegant, high performance combined concrete block and paving ranges use high quality exposed aggregates across Client: Fareham College Contractor: Woodman Civil Engineering & Leadbitter Construction Products Used: Pallas & La Linia Block Paving, Priora Permeable Block Paving, Tegula Block Paving, Keyblok Block Paving, Saxon Paving and Conservation Kerb a broad range of integrated plan sizes to create striking visual effects. La Linia is a subtly textured paving range ideal for pedestrian areas in contemporary civic and retail schemes which is also suitable for occasional vehicular overrun. Pallas successfully combines vivid colour with a highly polished texture designed to accent contemporary architecture and enhance landscapes with a modern feel. Also on the approach to the college and around the bicycle shelters, Marshalls Saxon Textured Flag Paving has been specified. Saxon is blended with a hard Yorkstone aggregate to deliver a unique surface finish, whilst the consistency of the textured surface ensures superb durability and non-slip properties. This paving has also been installed on flights of steps within the development, incorporating tactile flags at the top and the base of the steps together with visibility strips for safety and performance. In areas around the car park, Marshalls Priora has been selected. Priora is Marshalls’ original Concrete Block Permeable Paving (CBPP) system, combining the ever popular aesthetics of Keyblok block paving with a sourcecontrol sustainable urban drainage system (SuDS). Priora brings together excellent aesthetics and flood risk mitigation, removing surface water without the need for additional linear drainage systems. 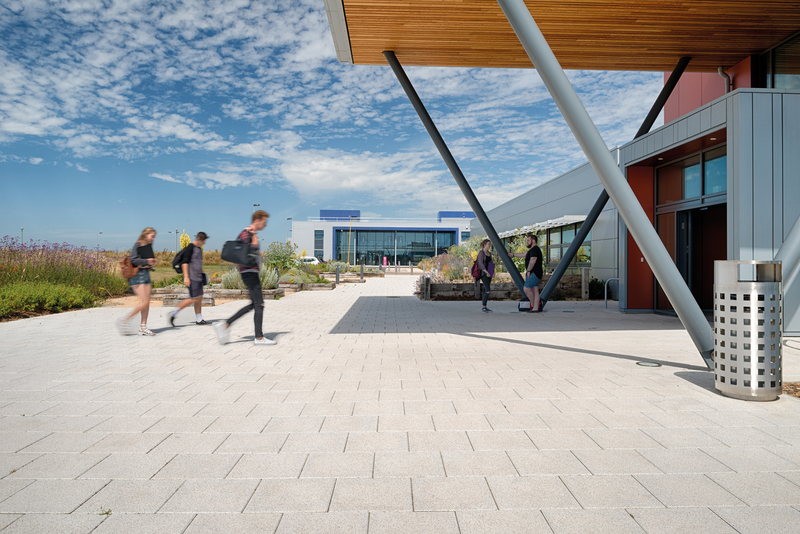 Hard landscaping at Fareham College has successfully enhanced the areas surrounding the buildings as well as contributing towards improving aesthetics within the college grounds and promoting pedestrian safety. Use of Priora within the car parking areas has ensured compliance with local building regulations in terms of the installation of naturally permeable surfaces.